I think the rule is that if you go somewhere on study abroad while in college, you are just required to love anything that is at all related to that city/country for the rest of your life. Thus, I had no choice but to be delighted by A Walk in London. 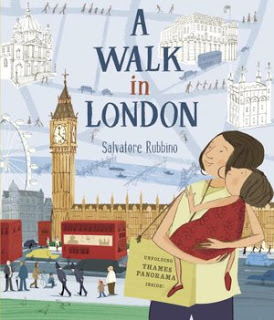 This book follows a little girl and her mother (this puts it right on the edge of fiction/non-fiction) as they spend a day visiting some of the most famous sites in London, including St. Paul’s, the Bank of England, Trafalgar Square, and Buckingham Palace. Seeing these places made me desperate to go back to London (I had no idea being a Cybils panelist was going to force me to take an international vacation – they should have warned me. . . ). The illustrations delight me, reminding me a little of the ones in the famous Madeline books. The simple lines keep the big, colorful spreads from seeming overly complicated. Also, when a book has a lot of little inserts of text around the page (in addition to the main, large block of text on each page), I sometimes feel a little overwhelmed, but this one did a good job of keeping things simple and arranging them in a way that made it easy for my eyes to move from fact to fact, instead of jumping around. Plus, these little facts were so fun and interesting – I didn’t know St. Paul’s had a whispering gallery or that the ravens at the Tower of London get an egg a week. Of course, the fact that one small child would be up to visiting this many tourist sites in a single day does make this book deserve a place smack in the fiction section, but that’s neither here nor there. I’ll definitely be pulling this book out before the first time we drag our children to London (which, after the horrors of getting Ella back to a normal sleep schedule after our Christmas vacation, looks to be about two decades from now). I fact-checked this book for my internship!!!! You are right. Study Abroad in a place makes you a fan for life. And so I love London and will have to make sure I return frequently. In the meantime, adding this book to my collection (when I find it) will be a fun way to relive the memories and share them with children. I love books for kids that are informative as well as entertaining! This looks like such a fun way to learn about London. I completely agree with the rule about being a fan for life of where you studied in college. I spent a semester in D.C. and love it so much that I dragged a 15 month old all over the city because I just had to show her everything. I loved this book! He also has one for New York, and I'm hoping for more cities to come! I've been to London twice. Both for only a little over a week but I still adore it and anything related to it.